he "Reservation Widget" allows your website visitors to book a room at your hotel directly from 3rd party websites. This widget provides quick and easy booking and reservation-setting options for your website users. By integrating this widget on other websites with it's powerful set of features, you can benefit from management of bookings, reservations, leads generation etc. With an intuitive step by step reservation process, reservation process will be a breeze for your users. 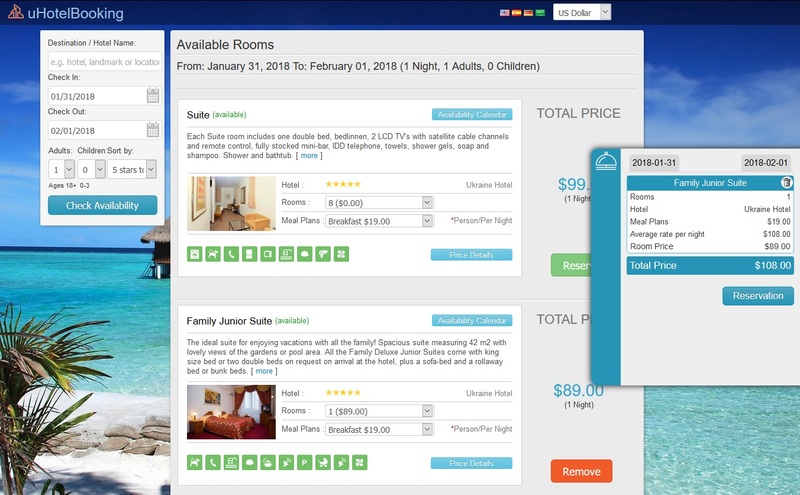 Our reservations widgets can be used by hotels and tourism operators of all types (apartment bookings, condo reservations, villa rentals, activities, car rentals, tour reservations, etc.). They can be customised for each of yuor websites, giving travellers a consistent experience while offering advanced shopping services including interactive quotes, reservations, bookings, lead generation and direct marketing. We provide 2 types of widgets for uHotelBooking script: free (embedded) and paid.